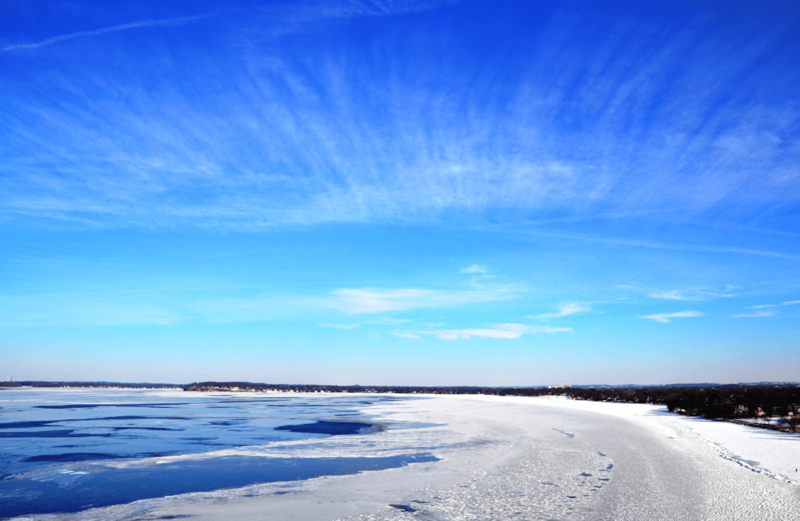 The staff at the Wisconsin State Climatology Office, located on the 13th floor of the Atmospheric and Oceanic Sciences building on the UW-Madison campus, is responsible for declaring lakes Mendota, Monona and Wingra frozen each year. Since freeze records in Madison go back to the mid-1800s, maintaining a consistent and reliable record is more nuanced than one might guess. This is part of the reason why, when determining the “ice-on” date for Lake Mendota, the staff might consider something like whether one might be able to row a boat between Picnic Point and Maple Bluff. Young explains that, actually, since early settlers wouldn’t be able to get a good view of the different bays and lobes of Lake Mendota, Picnic Point or Maple Bluff would be comparatively good vantage points. Pointing at a map, he showed me that the path between the two would cross “the deepest point of the lake,” — the ‘deep hole’ where the UW-Madison research buoy is anchored each spring. Early on, records were taken only during the school year. Not so anymore: Ed Hopkins, Assistant State Climatologist, said “I’ve been up here on Christmas.” Over the years, the responsibility has passed through many hands. Of course, the office also considers percentage ice cover and uses multiple vantage points. They have access to imaging from two NASA satellites if the skies are clear and sometimes use feeds from webcams on the AOS and the soils buildings. Plus, the freeze declaration isn’t made until a full day has passed to ensure that the ice persists. Hopkins took me up to the roof of the building to take photos and look out over the lakes and the many locations where ice records have been made and kept over the years. The history of the Wisconsin State Climatology Office and its predecessors is fascinating and somewhat complicated: some buildings Hopkins pointed out include North Hall, the Washburn Observatory (see ‘determining ice cover’), and Science Hall. Lyle Anderson, Office Manager and Data Services, pulled out some daily climate record books kept in the Washburn Observatory days. We were looking through freeze dates in 1915. “Oh! That’s 100 years ago this week,” Anderson remarked when we found a mention of a freeze for Lake Mendota: December 15th. I asked if notes like those are kept these days. The staff told me no, but Lyle shared that he’d been making notes of his own over the last few years. On the first day of December each year, anyone in the community can to join in on a long tradition by making a guess when Lake Mendota will freeze. You can enter the Mendota Freeze Contest, hosted by Clean Lakes Alliance, here. To make a truly educated prediction, one could take a look at the full history of ice on Lake Mendota or the Madison lakes ice summary. But the best bet probably lies in observation: taking a look at the water and hazarding a guess. Knowing our unpredictable Wisconsin weather, your guess is as good as ours. Theresa Vander Woude is the Associate Manager of Communication and Digital Media at Clean Lakes Alliance.